In my family, receiving a new pair of socks was a telltale sign of Christmas traditions. They would vary from year to year: ski socks, wool socks, fleece socks, ridiculous holiday themed socks. Whatever they were, they’d always be a welcome addition to our stockings. (The ski socks were always my favorite.) Inevitably, the sock-giving tradition faded as us kids left the house, but the memories are engrained in my mind. Recently, Point6 (as in, “98-point-6”…the human body’s optimal temperature) sent me a few pairs of winter socks to test out. While they were no Christmas gift, I determined that after jamming them into hiking boots, snowboard boots, business-casual kicks and a few loads of laundry, these Made-in-the-USA socks are worthy contenders as any and all holiday stocking stuffers. Admittedly, sock technology doesn’t really excite me, but there is something nice when a pair of winter socks meets my high standards: that they’re warm, durable and don’t itch. I’m happy to say that Point6 passed the first round of quality control with flying colors. With reinforced heels and toes and tight-knit material, all the socks are built to ward off wear and tear in the most typical places. Additionally, the soft, anti-microbial merino wool construction lends itself to a consistently dry, warm and blister-free climate that wicks sweat away from your feet. 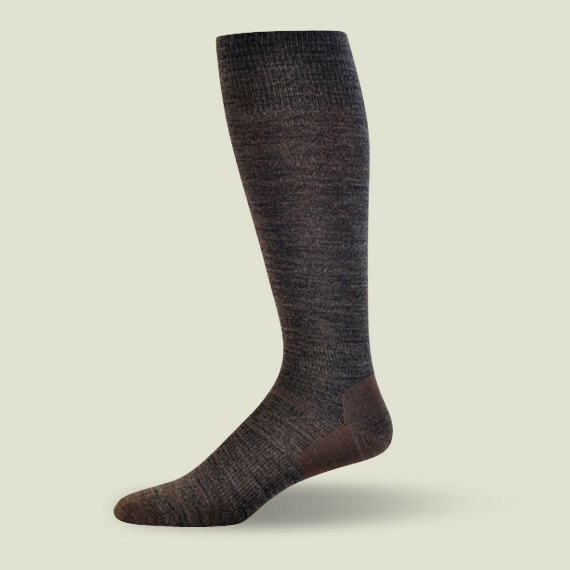 The Trekking Tech crew socks are made with merino wool for plush comfort and include mesh panels along the side of the foot to keep the climate well ventilated and dry. They’re offered in two thicknesses, but for long snowshoe hikes, I’d recommend opting for the heavy cushioned pair simply on the principle of added comfort. For a taller sock, look to the over-the-calf ski or snowboard socks. Tall and thin, the Ski Ultra Light Socks feature minimal (i.e., no) insulation for tight-fitting boots. Though perhaps not the best for casual snowshoeing, they do provide better mobility for snowshoe racers or runners who need a more athletic, next-to-skin fit. If you like ‘em cushy and warm, check out the Snowboard Medium over-the-calf socks, which are designed for a more comfortable fit. I struggle with women’s ski socks, as they’re occasionally too tight in the calves. (For an over-the-calf sock, I assure you that’s an important issue.) But it’s not a factor with either the ski or snowboard pairs. As an added perk, both versions have extra-deep heel pockets and an arch brace for better support. 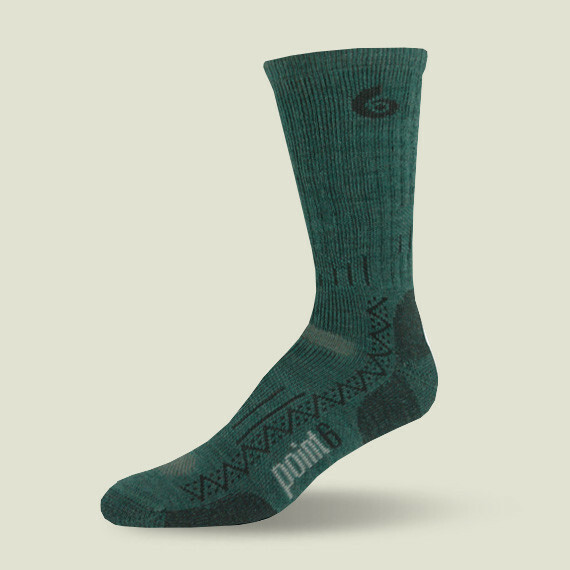 Whatever your preference or activity level may be, do yourself a favor and ditch any cotton or synthetic socks in your drawers and load up on Point6’s full line of merino wool socks, available online. From $18.95 to $22.95 per pair. To purchase Point6 products, click here. This entry was posted in Gear Reviews, Socks and tagged boots, footwear, gear review, Hiking, Merino wool, review, Snowshoeing, socks, wool by Stephanie Nitsch. Bookmark the permalink. Just bought 4 pair for Christmas. Thanks for the article and advice. Nice, Gary! Spreading the gift of warm and happy feet is appreciated by any and all. Cheers!